President Donald Trump speaks during a meeting with state and local officials to discuss school safety in the Roosevelt Room of the White House, Thursday, Feb. 22, 2018, in Washington. 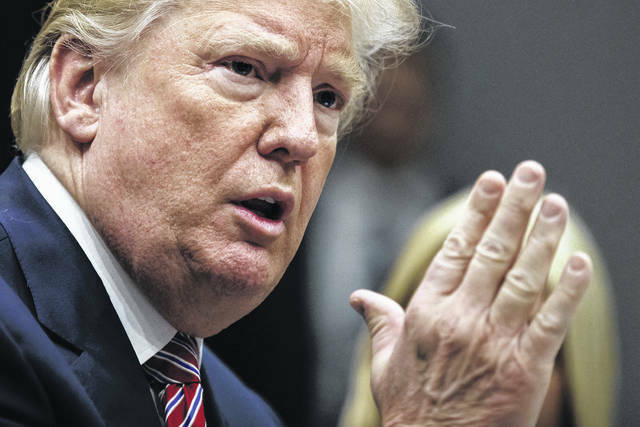 WASHINGTON (AP) — The nation should keep assault rifles out of the hands of anyone under 21, President Donald Trump declared Thursday, defying his loyal supporters in the National Rifle Association amid America’s public reckoning over gun violence. He also pushed hard for arming security guards and many teachers in U.S. schools. But there were no words of support from the NRA for his age-limit proposal — and outright opposition from organizations of teachers and school security guards for the idea of arming schools to deal with intruders. In Florida, Republican Sen. Marco Rubio said he now is open to raising age limits for long-gun purchases. That was the day after he was confronted at a CNN town hall by Parkland students and parents over his pro-gun votes and support from the NRA. She added: “I’m also thinking of young women” who may need a rifle for self-protection. In Congress, a bill being drafted by Sens. Dianne Feinstein, D-Calif., and Jeff Flake, R-Ariz., would apply more broadly than just to assault rifles such as the AR-15 used in the Florida shootings. It would raise the age limits for all rifles. The current federal minimum for buying handguns from registered dealers is 21, but the limit in most places is 18 for rifles, including assault-type weapons such as the AR-15. In some states — mostly rural states with a strong tradition of hunting — young people can buy a rifle at age 14 or 16.